A lot of product owners are good at making the business case for a project to go ahead, but very quickly end up with a backlog that is disjointed and seems disconnected from the original vision/goal that they started with. After a couple of sprints, it’s likely that most of the team (perhaps they too) have forgotten what the original goal was and why they’re doing the project. The phrase ‘can't see the forest for the trees’ comes to mind. makes this visible to everybody. But more importantly, can always refer back to this when explaining every user story on the backlog. and constantly refer back to this to explain why the team is working on the prioritised backlog and the individual user stories. 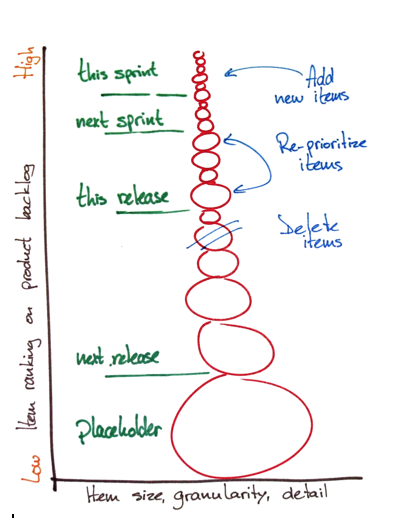 Often product backlogs are created by the product owner in silo and given to development teams. A lot of the time, the user stories are a set of task lists (or wish lists) the product owner wants the team to do. It can be difficult for the team to understand why they’re doing what they’re doing, especially if the vision hasn’t been stated. but also includes the business value (i.e. the so that…). This means the team fully understands the reasons and value of each user story and how it is intrinsically linked back to the vision. what the user is trying to accomplish rather than the feature in the system. A great product owner will try to work with the team to solve the problem/issue for the user. This is likely to allow the team to solve the problem in a way any individual wouldn’t have thought of doing. For the duration of a project, business goals, technology changes, new regulations, or a competitor's latest release will likely mean that the business/project priorities need to be changed in order to adapt. Often product owners and senior management will try to stick to the original goal in the hope that they will be seen as correct. Often that is not the case, and the project ends up delivering something that is out of date before it’s even launched. and modify the current product backlog so that it’s inline with what’s current now. The modern world moves at a rapid pace, and great product owners are able to ride the wave and change the product backlog accordingly without having to throw away lots of work. It’s very hard to say no to requests, but if it doesn’t align with the vision for the product, the product owner should be saying no, but providing the reasons for it in a friendly, and courteous manner. in collaboration with the team, turn the vision into a prioritised list of user stories that are small enough to deliver value to the users immediately. Having user stories that are large, vague, and take a long time to deliver are of no value to anybody. Splitting out user stories into small manageable chunks of work also allows you to prioritise and focus on the high-value items that should be worked on first. In an ideal world, the product owner should be available to the team at all times. However, most product owners will have other work to do too, so it may not be possible to be 100% available. They should try to spend as much time as possible with the team, preferably face to face, to work in a collaborative manner. If they aren’t available to respond to questions, or participate in team discussions, it’s likely that the project will struggle, due to the lack of leadership. If they aren’t available to provide feedback and sign off for completed user stories, the team is likely to lose momentum on the project. If they can’t be made available for considerable amounts of time to support the team, consideration should be given to a proxy product owner who has the authority to make decisions. The product owner should also be actively engaged and committed to the project's success. The more time they spend with the team and is working with them in a collaborative manner, the better the chances of success on the project. An engaged product owner is a natural leader, as they find themselves leading a team through their decisions and makes it apparent to the team that they are committed to the final product. Great product owners build up a very good rapport with the team, and builds relationships with them to allow the team to focus on delivering the right things at the right time. Great product owners are able to inspire and motivate teams just by being available to the team and working side by side with them to keep the project aligned to the original vision/goal. One of the best things they can do is to sit with the team as much as possible, so that they are available to the team and allow relationships within the team to be built. Product owners have been given permission by senior management to make the necessary decisions to build the right product. With this comes the product power to lead teams and drive their vision forward. Great product owners lead through empathy and humility, working side by side with the team to make the correct decisions. They show their empathy and humility through their past success, continually making the right decisions, and correcting poor decisions to lead the team forward. As any good boy scout will tell you, you should always be prepared. It comes as no surprise that great project owners are always prepared. They alway come prepared to the ceremonial agile meetings, they are prepared and ready to make the necessary decisions. A team will have greater confidence in their product owner, if they’re prepared for everything. If a product owner isn’t prepared, it will quickly become apparent, and the teams trust will be lost very quickly. It’s essential (and important) that the product owner is always prepared to lead the team, turns up to meetings with the right material, and takes pride in their work. No, I’m not trying to convert anybody to become religious, or even pledge their allegiance to the USA (‘In God we trust’ appears on a $20 bill). What is fascinating about religious people is their trust in their faith and trust in God (or gods for that matter). Some may even say it’s blind trust. So what has trust got to do with being a good product owner? Well, quite a lot actually. Having a product owner that trusts the team to make the right decisions, and vice versa having a team that trusts them is great for team harmony and more importantly being productive. Having a product owner that trusts the team means they can convey their vision, and know that the team will do their best to achieve that goal. From the team's perspective, having trust in the product owner means they’re doing the right thing and taking the necessary actions to deliver their vision for the product. Having a team and a product owner that trust each other doesn't’ just happen overnight. As the saying goes, trust has to be earned. Good product owners will establish a culture of openness and honesty within the team and encourage everybody to always be open and honest with each other, knowing that decisions and actions are being made for the betterment of the vision everybody is working hard to achieve. Trust also leads to respect. Having both trust and respect within the team and with the product owner helps immensely to deliver the right thing, at the right time, and with quality in mind.